Marine and freshwater resources and ecosystems are now recognised as ranking among the world's most valuable assets. Managing these resources wisely is a key challenge in the 21st century. New Zealand has jurisdiction over a maritime area that is 24 times the size of its land mass, yet relatively little is understood about this area's resources and capacity. The Coastal Marine Group (CMG) is a specialist niche operator in shallow water mapping and surveying, meeting the needs of researchers, managers, and developers of New Zealand’s marine and water resources. The group contains a mix of established and emerging researchers supported by outstanding technical personnel, and offers contract research, collaborative research, consultancy, survey work, monitoring programmes, data analysis and interpretation and shallow water mapping. To maintain and enhance the recognised national leadership and international standing of the coastal research at the University of Waikato for undergraduate and postgraduate training and quality research output. 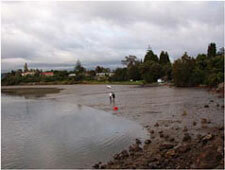 Fostering the status of New Zealand's leading coastal research group. To encourage national and international students to undertake coastal research training. To advance understanding of coastal processes in both a fundamental and applied context. To link with industry for specialised projects. To advance knowledge by maintaining a high level of peer-reviewed publications. To embrace a multi-disciplinary breadth to coastal marine issues as a platform for sustainable management of coastal resources. To focus on coastal sedimentation, geomorphology and morphodynamics, oceanographic processes, and coastal ecological impact monitoring. To maintain and enhance traditional research values and of quality output and peer-reviewed science. To maintain focus on applied research programs and link with industry. To ensure all graduate students are capable of running hydrodynamic numerical simulation models of coastal processes. To apply shallow multibeam echo sounding (MBES) to better represent coastal environment. Meet the people in the CMG. Find out more about our CMG research. Read about coastal marine study opportunities. Contact us regarding anything coastal marine-related.